A unique professional String Quartet / trio. After meeting at Music College, they began building their careers, working in quartets, orchestras and chamber groups. Through their unified vision to provide music for all, the String Quartet was formed. Over the years their work has taken them to many venues across the whole of the South East of England. The variety of work they have been involved with has included corporate functions, charity dinners, weddings, renewal of vows, anniversary/birthday parties and recitals. Our String Quartet specialise in helping to make weddings a day to remember, whether it be a church, civil or any other ceremony. They tailor every wedding to suit the needs of each individual couple, discussing everything from the music for the entry of the bride to the special request for Granny! Their repertoire covers a wide range of styles with music from Baroque to Pop. They are happy to advise those who are a little unsure of what they would like to hear being played during the ceremony. In addition, our String quartet are extremely fortunate to have a professional composer / arranger who will provide original music and arrange pieces at your request. This adds a very romantic dimension to the wedding when the couple hears music that is special to them. Their friendly dynamic personalities and professionalism make this Quartet an extremely popular choice. 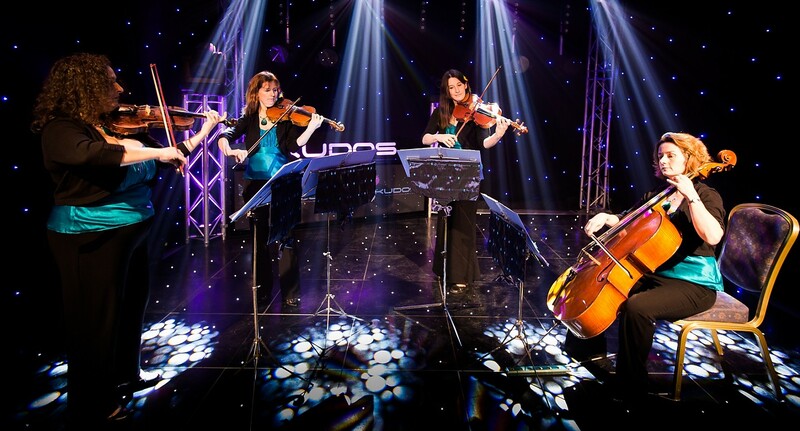 Why not book a Kudos String Quartets for your wedding or event today! Contact the sales team to see how we can find the perfect entertainment for you.